Fort Drane, Florida was established during the Second Seminole War in 1835 by Captain Gustavus S. Drane, 2nd U.S. Artillery, in Marion County. Built on the 3,000-acre sugar plantation of Colonel Duncan Lamont Clinch the post was first known as Auld Lang Syne. The fort was a 150 yard by 80 yard palisaded enclosure with blockhouses in the northern and eastern angles. The blockhouses were armed with cannon and there were some 300 loopholes for riflemen. The plantation house served as officers quarters and the rest of the command was housed in tents. The post was later renamed for Drane after the captain. 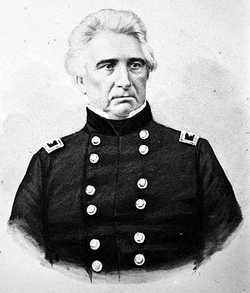 Colonel Clinch assembled a force of 700 regulars and was soon joined by 560 volunteers from Tallahassee, Florida. This force marched on the Withlacoochee River and engaged the Seminole Indians under Osceola on December 31, 1835, and suffered a severe loss. Colonel Clinch returned to Fort Drane to regroup and take care of the wounded and sick. The regular troops were withdrawn in June 1836 to Fort Gilleland in Newnansville and the fort was abandoned. The Seminole Indians burned down the fort and occupied the plantation. Tennessee Volunteers removed the Seminole from the site in October 1836 but did not rebuild the fort. There are no remains today.